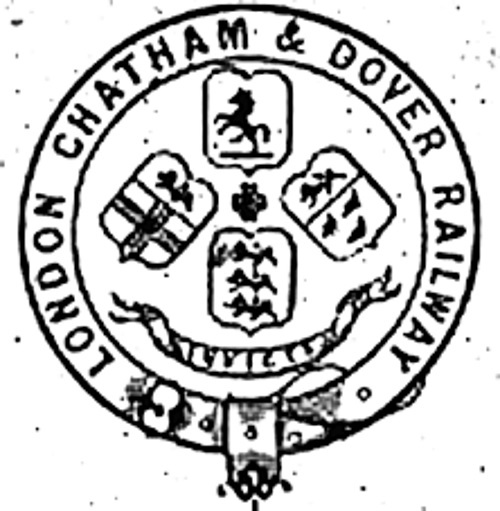 After almost a decade of planning the Canterbury to Dover extension of the London, Chatham and Dover Railway (LCDR) was finally opened to traffic on 22nd. July, 1861. At least two railway companies were initially involved in planning the construction of the line, the South Eastern Railway (SER) and the East Kent Railway (EKR), which transformed into the LCDR during construction. The War Office had expressed an interest for strategic military purposes, but this interest did not extend to the Government investing any money. 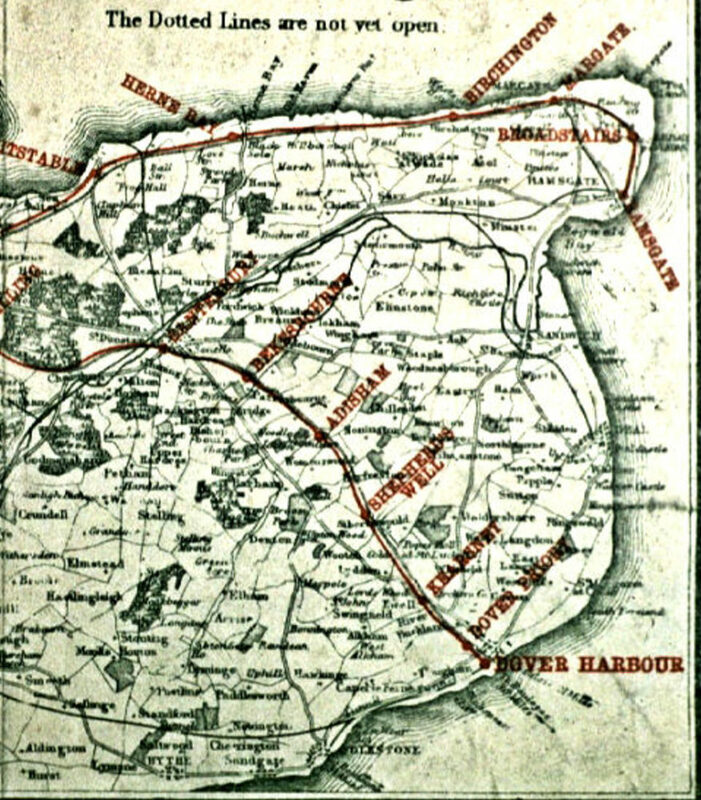 Several schemes involving different routes were put forward at various times prior to the EKR commencing construction in 1857. To begin with progress was slow and in May of 1859 only 250 men were employed on the whole length of the new line. This gave rise to increasing criticism of the contractor, who was T. R. Crampton, and in the following September the chief railway construction engineer, Joseph Cubbit, felt it necessary to report his dissatisfaction with Crampton to the board of directors. During construction several communities along the route of the new line requested a station and decisions had to be made regarding their siting. Adisham asked for one in late 1858, and in February of 1859 the board of directors received a deputation from the parishes of Nonington and Sibertswold (Shepherdswell) requesting the building of stations at Adisham and Butter Street, Sibertswold. The directors agreed to these requests providing the land for the stations was given free of charge along with an additional £.500 to cover the station’s construction costs. In December of 1858 similar conditions were applied to the provision of a goods only station at Bekesbourne, which the directors had initially decided was not warranted, but by the following November they decided to make into a proper station. Nonington Parish Vestry met at “The Royal Oak” on 10th March, 1859, and decided “after notice duly given to consider a recommendation of Mr. Thurston as to insertion of the line of Railway in the new Parish map” to include the railway line on the recently commissioned Poor Law Commissioners map of Nonington, which had cost the Vestry £ 156 19/- 9d. This new map accurately recorded the railway’s route and its acreage therefore allowing for the calculation of the parish rates payable. The hilly nature of the countryside meant that in some places deep railway cuttings had to be excavated to carry the track bed while in other places embankments were constructed from the spoil taken from the cuttings to carry it across the numerous valleys. In the parish of Nonington the cuttings required the building of bridges to carry existing roads across the railway line on either side of Soles Court Farm at West Court and Ruberries; one at Snowdown; two more by the present village of Aylesham on what was then Curleswood Park Farm; one at Ratling; and another close to Adisham station carrying the road that then formed the western boundary of Nonington parish, now the B2046. At Acol a single arch viaduct spans the present Womenswold to Nonington bridle way which was then a road, and the expense involved in this viaduct’s construction gives an indication as to the road’s importance in the 1850’s. The construction of the West Court bridge led to a slight diversion of Long Lane as the bridge was built at an angle to allow traffic using both roads to cross with only a slight “S” shaped detour. Again, the construction at some considerable cost of a brick bridge shows that the section of Long Lane known locally as “The Roman Road”, which is now a bridle way forming part of the North Down Way, was then an important road which 1859 Poor Law Commissioners map apportionment records as being one of the roads maintained by the Nonington Parish Vestry. The experienced “Navvies” employed to build the rapidly expanding railway system came from all over the British Isles. “Navvy” derived from “Land Navigator”, the name originally given to the labourers employed to dig the numerous canals commissioned in the late 18th and early 19th centuries and which were eventually superseded by the railways. “Navvies” were not always welcomed by the community in general. They were usually single men who often lived under atrocious conditions in temporary accommodation that they built for themselves alongside the railway they were constructing, it was not until the 1890’s that employers had a responsibility to provide accommodation for their workforce. “Navvies” had a not always justified reputation for hard drinking and violent behavior and their arrival must have been welcome by alehouse and beer shop proprietors, but with dread by other local inhabitants. Married men with families also frequently lived in similarly bad conditions with their children receiving little or no education (see 1861 census below). Many modern day “traveller” families are descended from these itinerant labourers who built the canals and railways in the 18th and 19th centuries. In the late 1850’s my paternal great-great grand-father, Walter Webb, moved from High Halden in Kent, where he had been a butcher and grazier, to Newington-next-Sittingbourne where he worked initially as a labourer on the LCDR railway (1861 census) and later become a plate-layer (1871 census). The building of the LCGR helped many irregularly employed agricultural labourers to find steady regular employment with much better rates of pay. The 1861 census returns for Nonington record railway workers lodging close to the railways route in private houses at Ratling and at “The Phoenix” public house and the Round House at Frogham [the converted brick base of one of the former Barfreston windmills], whilst other “Navvies” and their families appear to have lived in a “shanty town” on West Court Down. On the 1859 Poor Law Commissioners map of Nonington West Court Down is shown as stretching from the railway line to the road leading up from Frogham to Barfestone, this is area is now usually known as Soles Down. Nonington born William Collard, whom the 1861 census shows as living in a temporary settlement on West Court Down, had a wife and five children residing with him and the census shows his children as being born at various places in England which shows the nomadic lifestyle led by “Navvies” and their families which must have been very hard on the children. However, the census lists the four oldest children as scholars, so they must have been attending Nonington school. Some Nonington parishioners were listed in 1861 as labourers on the railway, and later census returns show Nonington residents as railway employees such as clerks and maintenance workers. The following is an extract from the 1861 census listing railway workers and their families in Nonington. West Court Downs (temporary accommodation). The railway proved a mixed blessing to the inhabitants of Nonington and the surrounding parishes. Some, especially land-owners and farmers, benefited as the railways made for easier and cheaper movement of their produce and livestock to a wider market offering better prices, whilst small local businesses such as tailors, shoemakers and black-smiths, would have to compete with more readily available and cheaper mass produced clothing, foot wear and metal goods and tools. Nonington had no station and it’s inhabitants had to travel to either Adisham station, for Canterbury and beyond, or Shepherdswell station, for Dover, to catch a train. In January 1874 Nonington Parish Vestry discussed the possibility of the building of a more direct road from Nonington Church to Adisham station via Old Court Hill and Ratling. However, this scheme was abandoned when the compensation payable to the land-owners on the proposed route was calculated to exceed £1000, making the proposed road’s construction much too expensive. 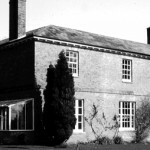 The highest demand for compensation came from the owner of Curleswood Park Farm, the Archbishop of Canterbury. After the coming of the railway the population of the Nonington and other East Kent parishes declined as it was then easier and cheaper for local people to escape the grinding poverty of a seasonal rural economy in the grip of an extended agricultural recession which lasted into the early 20th century and take up regular and better paid employment in the growing towns of North Kent and further afield. When the railway opened in 1861 the population of Nonington was 896, by 1901 it had dropped to 740. It was not until work commenced at Snowdown colliery in 1908 that the population of Nonington and Womenswold began to increase again. Snowdown and Nonington Halt was built in 1914 to make it easier for coal miners to get to work at Snowdown Colliery, which had begun coal production in November of 1912. The majority of miners at this time came from the Dover area and many walked to and from work at the colliery from Shepherdswell station or even from Dover itself. After Snowdown Colliery was bought in the early 1920’s by Dorman, Long, a group of iron and steel producers and engineering companies, the railway was used to help with the building of the mining village of Aylesham in the late 1920’s where a spur was built from the main line to transport the large quantities of building materials needed to build dozens of modern new houses in the countryside. The building of the village led to an influx of hundreds miners and their families and Aylesham railway station opened in July of 1928 so giving Nonington parish two stations for some twenty-five years or so until its division into the present day parishes of Nonington and Aylesham. Until the mid-1970′s Snowdown and Nonington Halt station was manned and older long term residents of Nonington will remember the tiny ticket collectors hut perched at the top of the stairs leading down to the Dover platform where there was a large wood and corrugated iron shelter for passengers, whilst the Canterbury side had a smaller shelter made from of the same materials. The East Kent Light Railway. Some Nonington residents also had access to another railway line. Literally a few yards outside of the eastern parish boundary out beyond Kittington was Knolton Station, a stop on the single track East Kent Light Railway, one of the Colonel Stephens group of cheaply built rural light railways in England, which ran from Shepherdswell Station to Eastry where the railway divided with one line going to Wingham and the other to Richborough. Knolton station opened on 16th. October, 1916, and closed on 30th October, 1948, and the platform was demolished and the track taken up in 1954. The station master’s house is still there at the top of the hill and is now a private residence. Hello. Lovely resource! But I wonder whether the photo on this page, entitled, ‘Knowlton Halt goods train date unknown’ is really correct? Those multiple telegraph wires don’t appear in any of the other photos and are a bit unlikely for a light railway line, and the 4-6-0 engine with tender drawing a heavy load through Knowlton would exceed the light railway’s wildest ambitions! Just to say we recently moved to Nonington last year (july 2014) and are finding your blogs and articles truly fascinating…. keep up the tremendous work it makes fantastic reading and a very interesting insight into the historical Nonington. Many thanks for your kind comments, I hope you continue to enjoy the site. Unfortunately I have not had the time recently to add new material and update existing items. I hope to be able to do this in the near future.